In May of 2015 a Bill was proposed to allow ‘the most substantial reform of consumer law in forty years or more’. One of the issues flagged for remedy in that Bill was ‘the absence of specific statutory rights for purchases of gift cards and vouchers’. At our regular meetings with Government Ministers we have continued to seek a solution to the issue of gift cards and vouchers by the introduction of statutory consumer rights for these products. 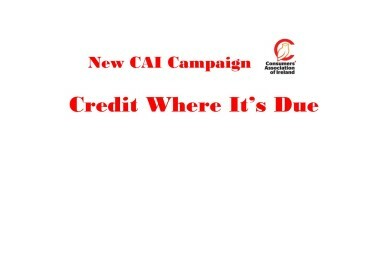 In August of this year the Consumers’ Association of Ireland, following years of inactivity or response to our call for action, remedy and change at Ministerial level, announced our intention to engage with retail and launch our campaign for consumers to receive Credit Where It’s Due. We have contacted the major retailer representative organisations and continue to await their responses and views. We understand that, this week, there will be an attempt made to introduce a new Bill in an attempt to deal with this specific issue – at long last! We support the initiative and will watch its progress with interest – but as we all know, the success of Private Members Law in Dáil Éireann is not good, therefore there is a continued need for the CAI, as the body representing Irish consumers, to campaign until the Government finally introduces statutory rights for consumers purchasing gift cards and vouchers. CAI spokesperson, Dermott Jewell, commented that ‘Irish consumers have, for too long, been issued with credit notes and vouchers – paid for in hard cash – with expiry dates that, in reality, devalue their money within an unacceptable and retailer-determined 3, 6 or 12-month period of time. After that period of time the note becomes of NIL value – a worthless piece of paper – but no loss to the retailer with money-for-nothing safely in the bank. The Consumers’ Association of Ireland (CAI) is seeking the support of retailers and businesses who value their customers and who want to offer them a more honest and fair deal – by placing a minimum 6-year validity upon all credit notes and vouchers that they issue – with immediate effect!